Following the first four chapters, you should now have a comfortable, reliable, driveable car. Now it’s time to make it look decent. You should already have thoroughly vacuumed the interior and removed any litter. Wipe interior plastic and vinyl surfaces down with a damp cloth and a little dish soap, follow with a second damp cloth to remove the soap, dry them with a clean terrycloth or microfiber towel, and then go after the nooks and crannies. Use leather cleaners rather than soap for leather surfaces. If you are going for a serious detail job, use an old toothbrush to really get the dirt up. Cleaning with a toothbrush may sound silly, but the bristles are just right for gently scrubbing dirt and grime off of textured plastic and vinyl surfaces. A fingernail brush has about the same texture but is better for larger areas. Cleaning things like the air vents and edges of panels with cotton swabs makes a real difference. Cotton swabs can also be used between panels, around the edge of switches, etc. Once all the dirt is gone, apply a protectant of your choice. Again, leather surfaces should get specific leather protectants, and the directions on those products should be followed. I prefer 303 Aerospace Protectant for most plastic and vinyl. It is an excellent UV protectant and has only a moderate sheen, which I prefer over greasy “wet look” products. Whatever you use, be thorough. Get the windshield pillar trim, kick panels, weatherstripping, plastic headliner trim, etc., in addition to the dash and door panels. Flip and/or slide the seats forward to gain access to all the areas you can’t normally reach. Drop the tilt steering column down so you can wipe down the upper surface of the column shroud. Open the doors so you can get the front, rear, and bottom edges of the interior door panels as well as any plastic sill plate trim or door aperture trim. Be thorough. Not as simple or easy as it sounds, but very rewarding. The first step is to get rid of all the old decals and parking permits with a razor blade. If the car has old bubbled or discolored window tint, remove that too. You can get directions for that around the internet. Use caution when working around defroster grids – they are notoriously fragile. Once the windows are clear of any unwanted additions, they can be cleaned. Of course you can start with a basic window cleaner such as Windex, but there may be water spots and filmy buildup that Windex will not remove. There are water stain removers available, and many people use #0000 steel wool to remove water spots, stains, and silicone from glass. It may take some time to do all the glass in the car, but be thorough. It is worth the effort. Clean glass makes any drive much nicer as well as safer and adds greatly to the car’s appearance. If your instrument cluster lenses are cloudy or scratched, remove them, and polish them with plastic polishing products or a fine polishing compound. This will often eliminate most scratches and haze. A mild cleaning wax adds a higher gloss and further polishes the lens. If your gauges needles are painted rather than translucent plastic, you can also touch up the paint on instrument needles at this time. Painted-on gauge markings can be cleaned with a soft pencil eraser. Try this in a hidden area to make sure it does not harm the paint. If there are any knobs or switches that are less than fresh-looking, remove them and really give them a good scrubbing with a toothbrush. Some switches can be lightly lubricated with a light grease or penetrating oil for a smoother action. As with other plastic parts, finish with a little 303 or other protectant. Obviously, do not use any protectant on steering wheel rims or pedal pads. It makes them slippery and unsafe. Look around the interior – are there any missing parts that need to be replaced? If everything is present, you can even repaint worn emblems and icons such as trim pieces on the dash, or the embossed icon on the cigarette lighter, or the text on the door lock handle. Be sure to clean and degrease it first. Again, Super Clean is great for this. Dry thoroughly before applying any paint, and let the paint dry thoroughly before handling anything you’ve painted. Repairing, removing, or replacing broken exterior lenses, missing trim, etc. Almost every used car has a few broken or missing bits of trim. Emblems get broken, turn signals get cracked, things fall off the car. Take a walk around the car and see what needs attention in this area. If you’re not going to use the trim anyway, just remove whatever’s left, but do it neatly. Use an appropriate adhesive remover from a body shop supply store to get rid of any residual glue or tape left on the car. Old engines get pretty nasty. Hopefully you got the engine bay fairly clean the first time around, but if not, clean it again thoroughly. Don’t forget the underside of the hood itself. A lot of grime can accumulate there. Take a good look around and see what’s ugly. Is there a corner of the bay that has started to rust? Does the wiring harness need to be cleaned and detailed with some protectant? Maybe the spark plug wires are jumbled up and can be straightened with some plug wire separators. Wipe them down with a little hand cleaner to remove all the grime they have accumulated. Does the air cleaner or valve cover(s) need a fresh coat of paint or a good polishing job? How about the exhaust manifold(s), master cylinders, or the radiator tank? If the paint is coming off the cam covers or air cleaner, they can be removed, cleaned thoroughly (again, Super Clean is a good choice), rinsed, dried, primed, and painted. Things like brake boosters and master cylinders are a hassle to remove and replace, but they can often be painted on the vehicle if nearby parts are carefully masked off. Other parts like battery clamps and small heat shields can often be easily unbolted for cleaning and painting. Take care to choose appropriate products for the job at hand. Overly glossy finishes look out of place on some parts. Use a low-gloss paint on low-glamour parts like master cylinders. Prep is important, too, so clean thoroughly, sand or scuff as necessary, and use a good primer. For aluminum parts I always use self-etching (zinc chromate) primer before painting. Finally, spray or wipe down plastic and rubber parts like radiator hoses and unpainted plastic engine covers with an appropriate protectant. When the engine bay looks good to you, shut the hood and move on. The bumper has been polished, but the fender, headlight door, and hood have not. There are a lot of great places to learn about professional quality detailing. My goal is simply to show you how to make a car that needs a little help look its best without the use of power tools or a professional. Assuming the car is still clean and dry from the last wash, we can give the paintwork and chrome some attention. Be sure to do all this in the shade while the car is cool to the touch. Clay bar treatments are available in any department store. There are plenty of other places to learn about them, but this would be a good time to clay the car if you are going to do it. 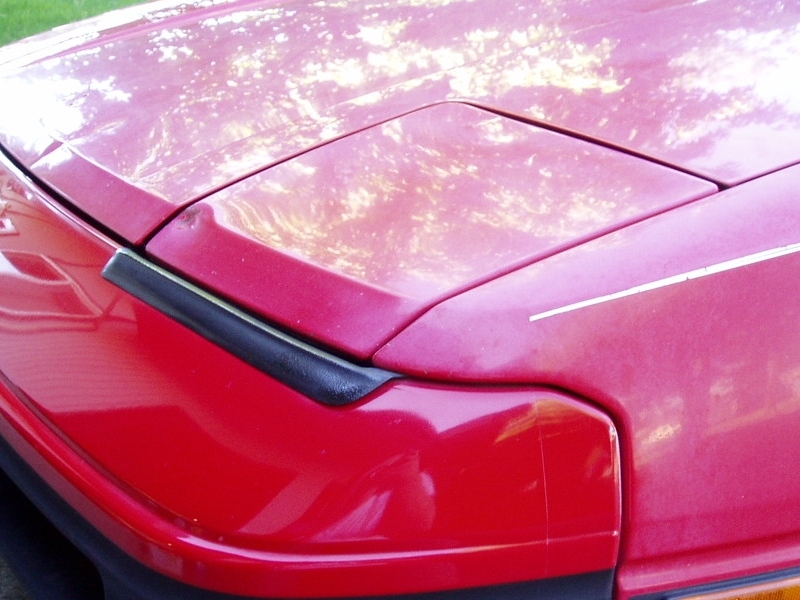 Depending on how and where it was used, your car may have scratches or chips that need touched up. The dealership may be able to get the correct touch-up paint for your car. If they can’t get it, the aftermarket (Duplicolor, PlastiKote, et al) may offer the correct color, or a local paint store dealing in automotive products may even be able to mix you something with your paint code. You can also order custom-mixed tough-up paint online if necessary. Be sure to prep anything you paint correctly by cleaning it thoroughly with an appropriate brush, using degreaser, primer, etc. Again, a paint store that sells automotive products will be able to help you here with advice and the tools to do the job. My preferred technique is to place a drop of paint in the chip or scratch and let it flow to the edge. After it dries, more can be added until the area is full of paint. Once the paint is applied, let it cure – this may take weeks – and then block-sand the entire area for a smooth finish. If you need to touch up any nicks or scratches in the paint it should be done before the car gets polished or waxed. Bear in mind that the paint will have to cure for some time before you polish or wax it. If the paint is in good shape, proceed with the polish, sealer, and wax. Everyone has their own opinions on which products are best and how best to apply them. There is so much information out there you could read for months. All I’m saying is now’s a good time to shine up your paint. After you’re done doing whatever you did, apply a good quality wax to the paint and to any chrome-plated parts. Make every effort to keep polishing compounds and waxes off any plastic and rubber parts, as it can be difficult or impossible to remove. It is often easier to mask those parts off than to try to avoid them altogether. This is really two seperate steps. To clean the wheels properly requires a water rinse, but the wheels must be dry to be polished. You already cleaned the wheels back in chapter one, but if you have to clean them again, use the correct wheel cleaner and an appropriate brush or cloth. I have cut down children’s toothbrushes to get between the spokes of mesh-style wheels because that was the only way to really get all the brake dust off the wheels. Do whatever you have to do to get them really clean. If the wheels are clean enough, go ahead and polish them with an appropriate polish. Naturally the choice of polish depends on the material the wheels are made of and the finish on them. Wheels can be aluminum or steel (sometimes magnesium) and may be machined, polished, chromed, or painted. On older aluminum wheels you’ll find that wet-sanding them first with some emery paper (progressively finer, from 400ish to 1500 grit paper) before applying polish will remove mild surface oxidation and let you bring out their best shine. Some wheels, generally chromed and painted ones, will do better with just a coat of wax than with any sort of polish. If you have plastic center caps with flaking paint, remove them, sand them down, prime them, and then paint them with an appropriate wheel paint designed to match the original color. Take your time, do the job right, and the wheels will look their best no matter what style they are. Like aluminum wheels, other aluminum parts can use a good polishing. Things like grille surrounds and rain gutter trim are often made of aluminum or stainless steel, both of which can benefit from a bit of effort with the appropriate polishing product and some elbow grease. If you have the time, you can also attack parts like cast aluminum timing covers and valve covers, but be aware that you’ll probably have to smooth them off first with a cartridge roll on a die grinder to get really good results. As-cast aluminum usually is too rough to polish up really well. Metal polishing is a subject unto itself, so use your own judgement. If a part has too many nooks and crannies, it’ll be a nightmare to smooth and polish and will never look all that great. If it’s already pretty smooth, it could shine up with very little effort. Years of heat, vibration, sunlight, and chemicals tend to take the shine off of things. Go over the car front to rear and see what needs attention. A few cans of the correct spray paint, paired with the right cleaning and prep products and the effort to do things right, can make things look new again. Parts like brake drums, mufflers and exhaust pipes, window trim, wiper arms, door handles, grilles, etc are often a matte black, and almost always need a fresh coat of paint to look good. As mentioned in earlier chapters, specific exterior trim paints are available for items like black plastic bumpers and fender flares, window mouldings, and exterior door handles. Other parts that may need some attention are visible chassis components like brake calipers, lower control arms, and rear leaf springs and shackles. Use your own judgement in deciding whether to highlight or hide these parts. Bright red brake calipers may look good, but yellow leaf springs do not. This is a good time to polish up dull taillight and marker light lenses. You can get plastic polish for these parts. I’ve also had success with aluminum wheel polish on plastic lenses. If the lenses can be easily removed, you can polish dull reflectors, or repaint them with bright silver paint, to produce a brighter light. Interiors suffer the effects of time, too. Most plastic and vinyl interior parts can be detailed very nicely with professional dyes and paints. Just as with exterior painting, interior parts need the correct cleaning, the right prep, and the right paints or dyes if they are to last. This is also an excellent way to make mismatched parts from the wrecking yard blend in with your car’s interior color scheme. If you do it right you can make a faded interior look nearly new again for a tiny fraction of the cost of replacing all those parts. 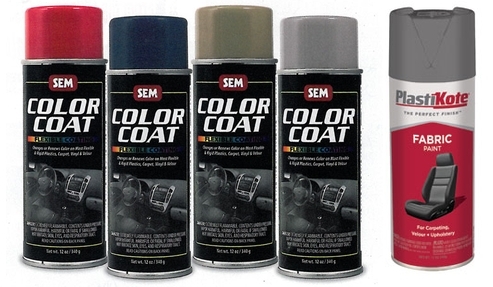 My favorite products are SEM Color Coat for plastic and vinyl, and PlastiKote Fabric Paint for carpet. Color Coat is available in dozens of OEM-style colors and gives a factory-fresh look to old plastic and vinyl. Fabric Paint, though it only comes in three colors, works wonders at restoring faded carpet. Did you know that the firewall carpet in your MR2 was once black? It can be again with a thorough cleaning and the judicious use of the correct products. Armed and dangerous. Faded and mismatched interiors are for chumps. This is an easy job. As before, I like 303 for most plastic, rubber, and vinyl surfaces, but sometimes thicker products give a more even sheen on larger parts like dash pads and bumper caps. See what works best for you. Once you find something you like, simply take your time and go over the entire vehicle with your favorite protectants, applying it to any appropriate surface. The best part about this is that you get to admire the results of all the work you’ve already done as you work around the vehicle applying these last finishing touches. By now you should know your car pretty well. By following this list you should have put your car in the best shape it can be in without doing any major repairs. Most cars can benefit at least a little from nearly every step in this list, and some can go from really ropey old deathtraps to tight cars that are decent to look at, safe, comfortable, and fun to drive. Hopefully this article has given you some idea of where to start on your own car and what to do to make it a useable vehicle that is both nicer to look at and nicer to drive.